Energetic Bodywork is a hands on practice involving massage techniques in tandem with energy channelling. It is used to relax and bring ease to the muscles and mind, while also aiding the release of stuck emotions and old recycled patterns of thought. This body-mind-spirit release allows the cells of the body to regenerate in a new way. Contrast Stone Massage involves the use of hot and cold stones and crystals for the purpose of stimulating and strengthening the body's natural immune system response. This can help to protect the body from bacterial and viral infections, as well as increase the body's ability to heal from pain, stress, or injury, and can help improve circulation, mood and energy. Reiki comes from the Japanese words Rei and Ki. The word 'Rei means "spiritual wisdom" or "Higher Consciousness", while the word Ki means "universal life force energy". Therefore, Rei Ki is universal life force energy guided by a Higher Power. 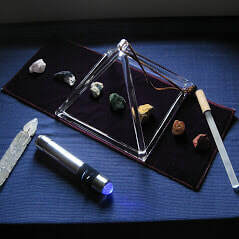 Reiki is a Japanese natural healing technique that guides this energy into the client's body using gentle touch for the purpose of balance, wellness, stress reduction, and relaxation. Reiki is also used for releasing energetic blockages in the body which can lead to illness if not removed.